Informal meetup the afternoon/evening before starting the Music Hack Day. Hackers and companies' evagelizers are all welcome. Demo-ing some of the projects and technologies the Music Technology Group is currently involved in. The perfect chance for hackers to get to know each other before the MHD. Xth is startup company making free and open biotechnologies co-founded by Marco Donnarumma and Heidi Boisvert. Their projects seek to blur the boundaries between human and technological bodies for new modes of understanding and expression. For the introductory event of the MHD Barcelona they present "Ominous", a musical performance for the Xth Sense, a biophysical technology originally created by Marco and named the "world's most innovative new musical instrument" by the Georgia Tech Center for Music Technology. Ominous is an incarnated sound sculpture. The performance embodies, before the audience, the metaphor of an invisible and unknown object enclosed in his hands. This is made of malleable sonic matter. Similarly to a mime, Marco models the object in the empty space by means of whole-body gestures. By using the musical instrument Xth Sense, the bioacoustic sound produced by the contractions of my muscle tissues is amplified, digitally processed, and played back through nine loudspeakers. The natural sound of his muscles and its virtual counterpart blend together into an unstable sonic object. This oscillates between a state of high density and one of violent release. As the listeners imagine the object's shape by following his gesture, the sonic stimuli induce a perceptual coupling. The listeners see through sound the sculpture which their sight cannot perceive. The premiere of Ominous took place on 3rd November 2012, during the World's Music Days, at The Singel concert hall, Antwerp, Belgium. 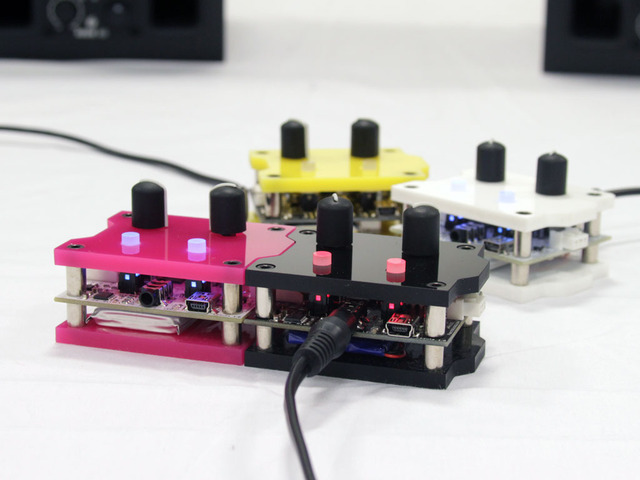 Patchblocks are electronic music instruments that fit in the palm of your hand. They are affordable, battery powered, stand-alone and easily programmable with a visual programming language. You can create your own instruments with Patchblocks while being given the freedom to explore the worlds of software programming, hardware hacking and electronic music performance. Members of the Patchblocks community will be showcasing their creative uses of the platform in a live performance and jam session. Universitat Pompeu Fabra - Campus de la Comunicació - Tanger Building, 3rd Floor. How to arrive to the venue?